Aga Khani Nizari Ismaili sect of Shia Islam as well as a minority of Sunni adherents. Green portion of the map above shows those parts of Badakhshan, comprising Tajikistan (Gorno-Badakhshan Autonomous Region in Tajikistan) in the northernmost zone and Afghanistan (Badakhshan Province in Afghanistan) in the easternmost and southernmost areas. 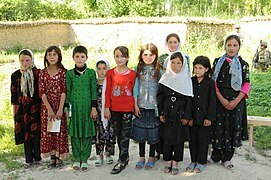 The Pamiris (Dari: پامیری‎; Tajik: Помири) are an Iranian ethnic group who are native to the Gorno-Badakhshan Autonomous Region of eastern Tajikistan, the Badakhshan Province of northeastern Afghanistan, the Taxkorgan Tajik Autonomous County in Xinjiang, China, and the Chitral and Gilgit Baltistan regions of northern Pakistan. The Pamiris are composed of people who speak the Pamiri languages, the indigenous language in the Gorno-Badakhshan autonomous province. The Pamiris share close linguistic, cultural and religious ties with the people in Badakhshan Province in Afghanistan, the Sarikoli speakers in Taxkorgan Tajik Autonomous County in Xinjiang Province in China, the Wakhi speakers in Afghanistan and the Wakhi speakers in Upper Hunza Gojal region of Northern mountainous areas of Pakistan. In the Pamiri languages, the Pamiris refer to themselves as Pamiri or Badakhshani, a reference to the historic Badakhshan region where they live. In China, Pamiris are referred to as ethnic Tajiks. In Afghanistan, they are recognized as ethnic Pamiris and the Afghan National Anthem mention Pamiris (پاميريان Pāmiryān) in the list of ethnic groups of Afghanistan. The Pamiri people have their own distinctive styles of dress, which can differentiate one community from the next. The styles of hats are especially varied: one can spot someone from the Wakhan, as opposed to from Ruhshon or Shugnon valleys, based solely on head wear. In 1929 Gorno-Badakhshan was attached to the newly formed republic of Tajikistan, and since that point there has been a great deal of controversy surrounding the ethnic identity of the Pamiris. Some Tajik scholars claim Pamiri languages to be a dialects of Tajik language and there has been a long running debate as to whether the Pamiris constituted a nationality separate from Tajiks. But there is a consensus amongst linguists that the Pamiri languages are East Iranian, a sub-group of Iranian languages while Tajik language which is Persian is included in Southwestern Iranian, another sub-group of Iranian languages. In the 1926 and 1937 Soviet censuses Rushani, Shugni and Wakhis were counted as separate nationalities. After 1937 these groups were required to register as Tajiks. During the Soviet period many Pamiris migrated to the Vakhsh River Valley and settled in Qurghonteppa Oblast, in what is today Khatlon Province. In the 1980s debate raged in Tajikistan about the official status of the Pamiri languages in the republic. After the independence of Tajikistan in 1991 Pamiri nationalism stirred and the Pamiri nationalist political party Lali Badakhshan took power in Gorno-Badakhshan. Anti-government protests took place in the province's capital, Khorog, and in 1992 the republic declared itself an independent country. This declaration was later repealed. During the Tajikistan Civil War from 1992–1997 Pamiris in large backed the United Tajik Opposition, the Pamiris were targeted for massacres, especially those living in the capital Dushanbe and Qurghonteppa Oblast. In the early 1990s there was a movement amongst Pamiris to separate Gorno-Badakhshan from Tajikistan. Fatimid-Ismāʿīlī Islam had been introduced to the Badakhshan and Pamir (valley) by Nasir Khusraw al-Qubadiani, who was appointed as the Dā'ī al-Mutlaq and Hujjat al-Islam by Fatimid Caliph Abū Tamīm Ma'add al-Mustanṣir bi-llāh for Pamiris in Turkestan and Badakhshan in Afghanistan. Today's Pamiris are predominantly Nizārī Ismā'īlī Shia and follow the Aga Khan. The Aga Khan Foundation became the primary non-governmental organization in Gorno-Badakhshan. There are also Sunni Pamiris currently numbering at approximately a few thousand. Shirinsho Shotemur, politician, one of the founders of the Tajik Soviet Socialist Republic. ^ Results of the 2000 population census in Tajikistan. ^ Minahan, James B. (10 Feb 2014). Ethnic Groups of North, East, and Central Asia: An Encyclopedia. ABC-CLIO. ^ "Afghan National Anthem". Nationalanthems.info. Retrieved 2012-06-21. ^ "The Pamiris: People on the Roof of the World". Paramount Journey. Retrieved 2016-09-07. ^ Cheshko, S. V. (1989). "Не Публицистично, Но И Не Научно". Sovetskaya Etnografiya Akademiya Nauk SSR I Narodnyi Komisseriat Prosveshcheniya RSFSR (5): 23–38. ^ Suny, Ronald Grigor (2006). "History and Foreign Policy: From Constructed Identities to "Ancient Hatreds" East of the Caspian". In Shaffer, Brenda (ed.). The Limits of Culture: Islam and Foreign Policy. MIT Press. pp. 100–110. ISBN 0-262-69321-6. ^ Suhrobsho Davlatshoev (2006). "The Formation and Consolidation of Pamiri Ethnic Identity in Tajikistan. Dissertation" (PDF). School of Social Sciences of Middle East Technical University, Turkey (M.S. thesis). Retrieved 2006-08-25. ^ Balcıoğlu, Tahir Harimî (1940). Hilmi Ziya Ülken (ed.). Türk tarihinde mezhep cereyanları (in Turkish). İstanbul: Kanaat Yayınları, Ahmed Sait tab'ı. p. 136. Chapter on Mısır Fâtımîleri ve Aleviler'in Pamir Teşkilâtı. ^ Salopek, Paul (October 9, 2017). "Islam in Hiking Sandals—and Red Spike Heels". National Geographic. Retrieved October 14, 2017. If these women are extraordinary, it’s partly because Pamiri culture is special. They are followers of Ismailism, a tolerant branch of Islam led by the 49th Agha Khan, a spiritual and temporal leader descended from the Prophet Mohammed. This page was last edited on 11 April 2019, at 16:33 (UTC).